Just like Q1, we will be focusing on 3 KALs which we will all vote on at the end of the quarter! The next 3 up-to-bat are Hitofude Cardigan, No Sleeves, and Mitered Squares. Speaking of voting, who won the Q1 $20 store credits, you ask?!? The credits have already been added to your accounts! Congratulations! A big thank you to everyone for submitting and voting!! Trivia starts back up next week (April 6) but we are adding a little twist! This quarter’s theme is called PhotoPLUS. Each week we will post a picture of a random skein and you will have to identify the dyer and colorway. You will find the question and submit your answers just like you always have – on the Google doc. But that’s not all! We will post an additional brain teaser/question relating to that week’s trivia photo on Ravelry on Fridays for you to play along with your teams. Keep track of your 10 answers throughout the quarter (similar to the crossword puzzle from last year) and send them in at the end of the Q2. Here’s a template for you to use: PhotoPLUS The team with the most correct submissions will win a prize! You can submit by mailing your answers to the store address or e-mailing them to trivia@eatsleepknit.com. You can find your first question here. 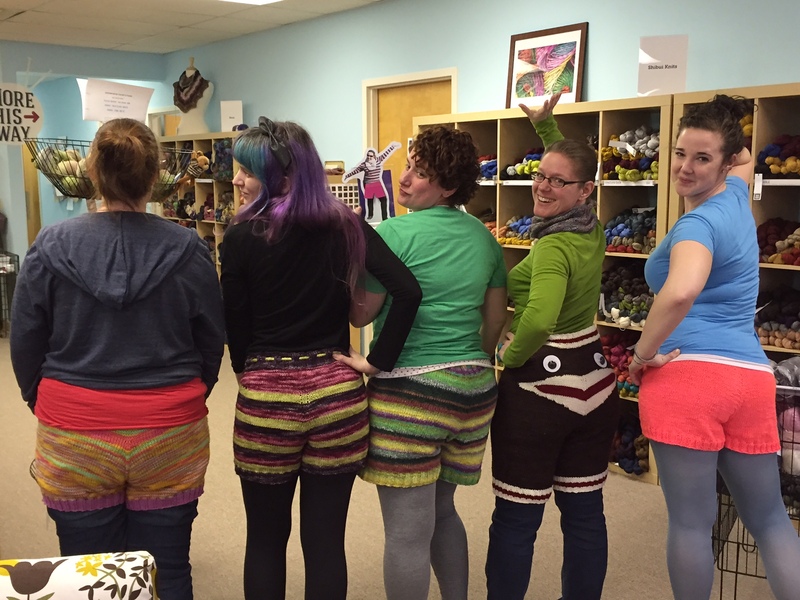 Check our Twitter or Ravelry Page every Monday for the new photo! Your dashboards will be updated on Monday by noon Eastern. 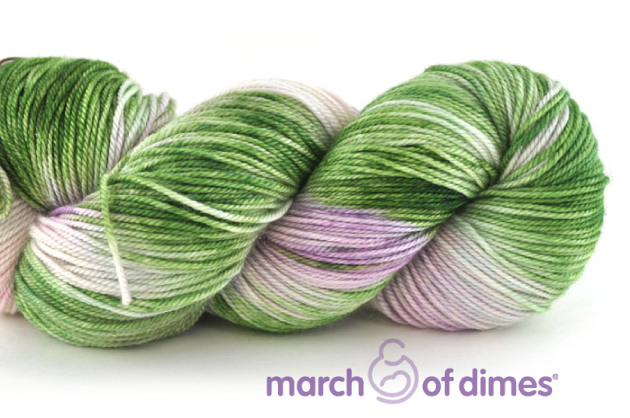 April’s colorway is special, one that is near and dear, and it had to be April. April 3rd was the day our first child, our first daughter, was born. Stillborn, actually, as a result of extreme prematurity when I went into labor at 23 weeks pregnant in 2012. Little Magnolia is for Amy, our first child, our first daughter. It’s also for all the babies just like her, born too soon, too early, for reasons known and unknown. We are donating every penny of sales of this colorway to March of Dimes, an organization which, I must admit, prior to Amy’s loss, I still thought was somehow related to polio. It’s not, anymore. The March of Dimes fights against premature births, and even then I wondered, how can the March of Dimes stop biology? And the answer is, by supporting, funding, and sponsoring research into not only finding out why but also finding out how to intervene. Thanks to the interventions and protocols and treatments researched by the March of Dimes, we have been able to have a healthy, full-term son. And, as many of you know, we are actually expecting our third any time now, our second daughter. With any luck, thanks to the advancements in medical care that the March of Dimes champions every day, we’ll get to see her grow up. And so will many other families with similar stories. Shortly after Amy died, friends of ours called me and said they wanted to get us a tree in her honor. 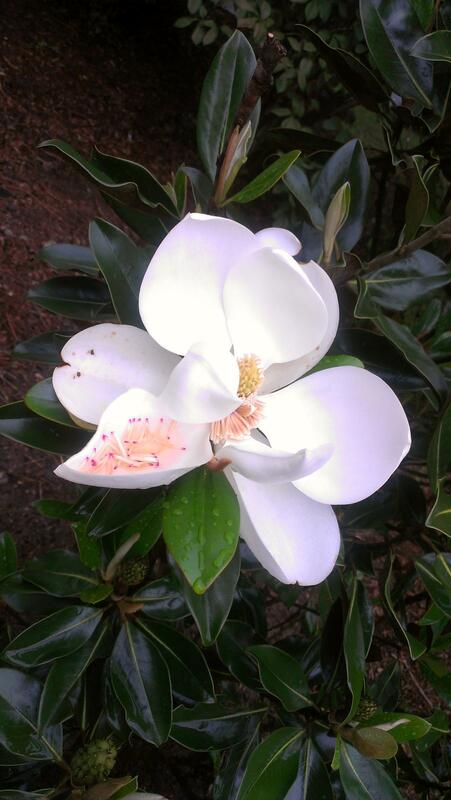 A Gems Magnolia, a Georgia favorite, known colloquially as a “Little Magnolia.” It was perfect. We planted it in our front yard, and when I went outside on that first Mother’s Day, this was what I saw. It took a lot of courage for Erin to choose to share this. Premature births are difficult no matter the outcome, but there are ways to help, give/receive support, and spread hope. The fiber community is a loving one so, whatever your cause, reach out! Little Magnolia will be available in the following bases: TML, Pashmina, Tosh DK, Tosh Vintage, and Tosh Sock. If you’d like to make your own donation to March of Dimes, click here.